Having a schedule for your home maintenance tasks makes complete sense, as you can be sure that everything that needs to be tackled, will be, and within the right timeframes. It’s just a great way of tracking these tasks, just like you track your day to day tasks in a diary, and your chores in a cleaning schedule. 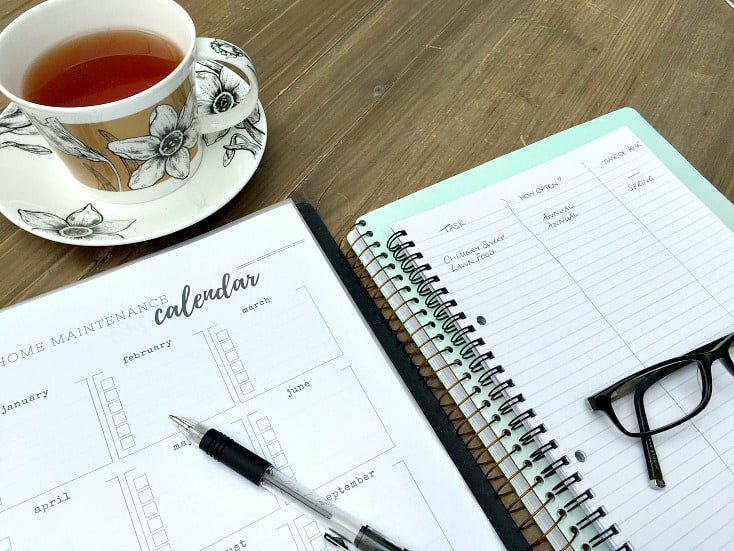 So, today I wanted to show you how quick and easy it is to put a schedule together, in the hope that you spend a couple of hours over the next few days creating your own – and making life that little bit easier! As always, planning is key to a great schedule, and the first thing with any schedule is to know what you need to fit into it. Then all you need to do is walk around your home, writing down any tasks that you can see that will need to have attention at some point (or points) during the year in the first column. EXTRA HELP – You can grab a checklist for free HERE of 50 home maintenance tasks that you might want to add to your own schedule. Every home is different, and so you will have to decide what tasks fit you and what don’t, but it will get you thinking in the right way about the sort of things to look for on your walk around the house. Home maintenance tasks tend to be tasks that aren’t done very often each year. As such, I like to work on a monthly or seasonal basis for this step. 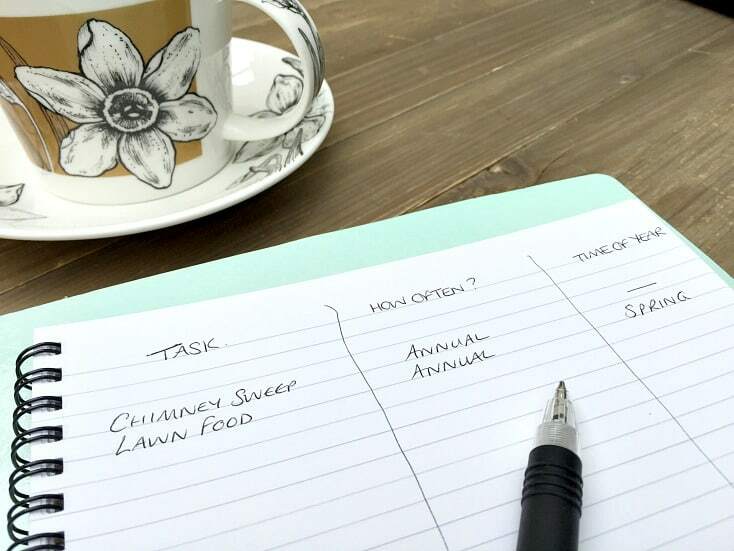 Simply go through each task and work out how often you want to get them done – filling in the middle column of your list as you go. Once you’ve got a list of all the jobs, and how often they need doing, then you can start to add them to a calendar. 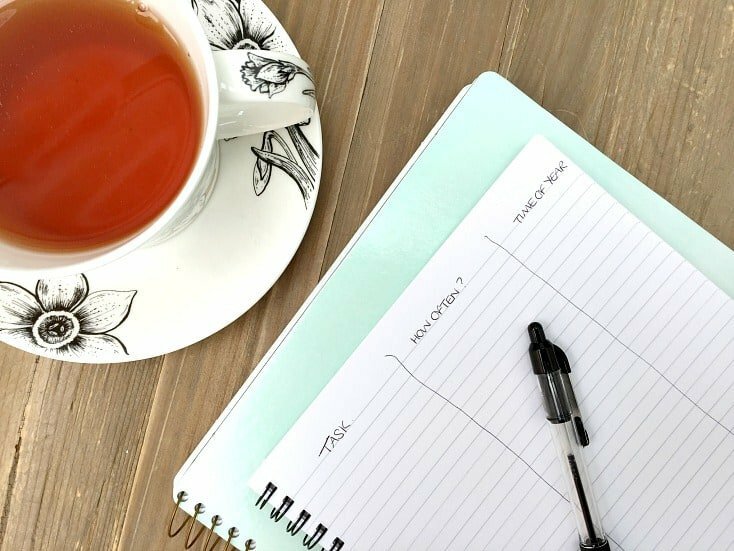 I have a calendar ready for you to fill in within my Home Maintenance Planner if you prefer something pre-done – or you can simply write each month on a piece of paper and add in tasks to each month. TIP – Add in the tasks that need doing on specific months first, then anything that needs doing on specific seasons, and then add the rest in the spaces left. Ideally you would be looking to fill each month with a similar amount of work – rather than have a very busy month one month and nothing the next…. It’s easy to create a home maintenance schedule – it’s much harder to stick to it! As such, you want to add reminders at the start of each month to your diary / chores schedule / cleaning schedule – wherever works best for you – to check that months tasks and get them done. I don’t schedule any further than this, because you may want to tackle all the tasks in a weekend, spread them over the month, or they may simply take a few phone calls to book people in to do the tasks for you. If you schedule too tightly then you may feel restrained and not get them done at all – which kind of negates the point of doing it in the first place! 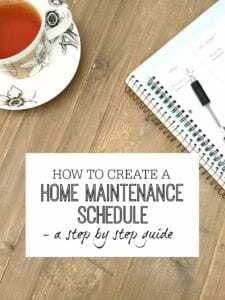 I hope this shows you just how easy and quick it is to set up a home maintenance schedule, and gives you the inspiration to get started with your own. It will (I promise!) save you lots of time and energy in the long run – and also help when you want to delegate more to other people in your home (because you’ll know exactly what needs doing at a glance). Good luck, and let me know how you go. P.S. – If you want to create your own Home Maintenance planner – with a Home Maintenance schedule, suppliers lists, home inventory etc… inside and all created for you – then check out mine HERE. I love using it as part of my Home File!